Have you ever considered if there are different ways to which we can experience God's presence? I want to begin a 4-part series on the ways in which we can experience His presence. To help us understand the different ways, I want to refer to a philosophy professor and author at USC by the name of Dallas Willard. In his book, Hearing God, he outlines four different ways a person can experience the presence of God. 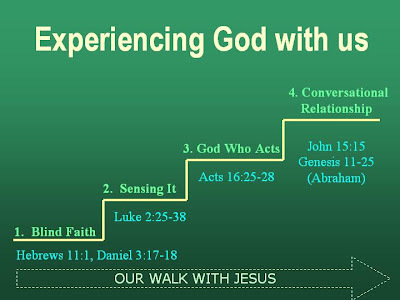 The following is a diagram I put together to give you a visual picture of the four ways we can experience God with us. For this first week, we will discuss blind faith. This faith is about believing despite not seeing or feeling God’s presence. We just have this confidence and trust in God’s presence. and he will rescue us from your hand, O king. worship the image of gold you have set up. This is a legitimate way to experience God’s presence, but I believe our hearts will be restless if we stop here. If you really believe we are made for a relationship with God, then there has to be more to the relationship than just an intellectual belief that God is with us. I believe my wife loves me, but if that was all I had to go on, if she never said anything or showed her love for me, or if I didn’t feel her love for me, or talk with her regularly, I think I would start to get the impression that I was getting short-handed in our relationship. Is it any different with God? The relationships we long for are a direct result of being made in His image and likeness. We serve a God who is three Persons, but at the same time one God. There is something in each individual Person of the Trinity that cannot be found in the other. 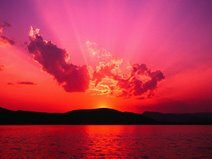 There is something in the Son that is not in the Father or Spirit. There is something in the Spirit that is not in the Father or Son. There is something in the Father that is not in the Spirit or Son. God’s completeness is in the fact that all three Persons live in relationship with each other. We serve a God who finds His completion in relationship with others. He had made us in His image (Gen 1:26,27). I find it interesting that Jesus, when forced to go on blind faith alone because He couldn’t feel or sense God’s presence while hanging on the cross, cried out, “My God, my God, why have you forsaken me?” For Jesus, blind faith was not enough. His relationship with God needed more. This leads us to the next way we can experience God’s presence in which we will talk about in 2 weeks. I'm taking next week off for a pastor's retreat. Dallas Willard, Hearing God, (Downers Grove, IL. IVP), pp. 46-52. I really got a lot out of your message Sunday night! Thanks for posting the diagram online! Thanks for commenting and not falling asleep! HA! The Trinity is one thing I will not reconsider. It would be fun to have some discussion on that with you Adam and talk about why it is so hard to believe God can still be One and at the same time Three. I would like to know why you struggle so much with that? I noticed in some of your writings that you didn't consider Jesus' affirmation of the voice from heaven (Father)and the descending dove (Spirit) as witnesses to His Person. Why? It would be great to discuss this subject with you. This will give you the main reasons why many simply will not believe God can still be One and at the same time Three. Then let's take it from there. this shows the man, Jesus of Nazareth; being anointed by the spirit of the ONE GOD, the Father. Also the ONE GOD, the Father, speaks from Heaven. So we have ONE GOD in Heaven; anointing His Son, the man Jesus; with His Spirit. Nothing here about the ONE GOD supposedly being THREE?!? Rather, its about the ONE GOD anointing His Son! We do share something here, we believe God is One. You act like I don't believe God is One God. I do! I just believe that He can also be three Persons at the same time. What about Genesis 1:26's use of "us" when God is talking about making humans in His image?